This fun list of nature based learning activities includes games for teaching math, science, and early literacy skills. Get your kids outdoors while the weather is nice to enjoy learning the way Mother Nature intended. Stepping outside transports young learners into a vast (and free) sensory playground that encourages natural learning. With the activities below, your kids will explore math, reading, and science concepts by crunching leaves, breaking sticks, splashing in water and much more! I hope you can find time to enjoy them all. Happy learning! Leaf Sorting by Danya Banya – Kids will learn beginning science and problem solving skills by sorting leaves by a variety of attributes. Numbered Nature Tray, by Cutting Tiny Bites – Simple counting and number recognition practice using outdoor items. Mini Ecosystem, by Stir The Wonder – Your kids will record scientific observations as they observe their very own DIY ecosystems. 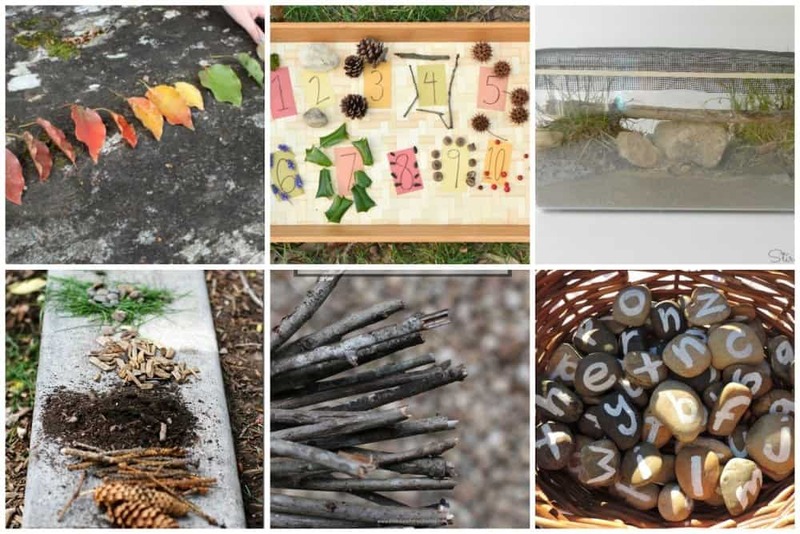 Outdoor Math Activities, by Mama Smiles – Simple ideas for how to use everyday nature items for learning. Teach Tally Marks With Sticks, by The Educator’s Spin On It – What better way to learn tally marks than with free materials? Sight Word Stones, by The Empowered Educator – Read create and practice sight words with these fabulous DIY letter stones. Counting Nature W/ Free Printable Nature Cards, by Mom Explores The Smokies – Roll the dice and draw a nature card to see which nature item to count! Nature Journals, by EDventures With Kids – A fun way for kids to organize their nature observations, complete with free printables. Color Matching Nature Walk, by Fantastic Fun & Learning – A fun color matching game using totally free supplies. Nature Patterns, by One Time Through – Teach your kids the basics of pattern building using scavenged nature items and a free printable! Finding Symmetry in Nature, by Buggy and Buddy – A step by step science lesson that teaches your kids about symmetry using natural items. Decodable Reading With Nature, by Sugar Aunts – Practice reading skills by word building with this free outdoor material! Insect Hotel, Teach Beside Me – Allow your kids to observe a bug’s life by creating an inviting bug hotel in their very own back yard! Sorting Parts Of A Flower, by Munchkins and Moms – Learn basic parts of a plant with this simple and inexpensive sorting activity geared towards young learners. Inspecting Pond Water, by Where Imagination Grows – Let your kids feel like a real scientist by observing pond water, using the tools of the trade, and recording their observations. Raising Butterflies, by Pre-K Pages – Explore the life-cycle of a butterfly by hatching eggs and watching them transform into the the beautifully winged creatures we all adore!